The prototyping process is a physical manifestation of the growth mindset that characterizes design thinking. The info gleaned from testing each prototype – and each prototype’s particular weaknesses – informs the next evolution. Some truths about prototypes: One of the smartest expenditures a startup can make is on prototypes. Different levels of prototypes offer different benefits along the process journey. Their level of fidelity, or quality, should increase as the product evolves. Entrepreneurs should not be afraid of producing a prototype that fails – they should embrace it as a ripe learning opportunity. 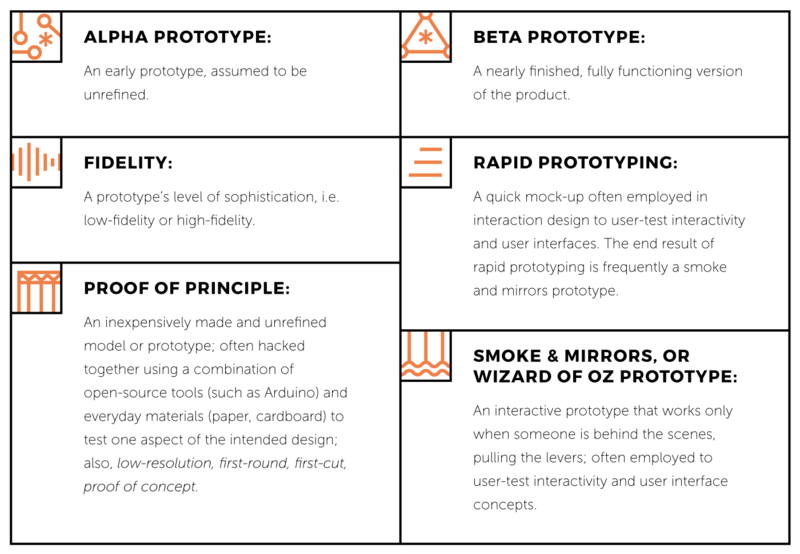 Crafting exploratory prototypes is an effective way to catalyze the product definition phase. Take the case of a client — a startup led by serious racquet sport enthusiasts — who wanted to develop a new training aid. Once they settled on a concept, they built a crude “proof of principle” model, or “low-resolution” model, to test out the idea. After a few weeks of work, they had a first prototype that gave them the look and feel of the physical product they had in mind. It was hacked together using an Arduino (modular, adaptable electro-mechanical kits), quick and dirty CAD, additional development or “dev” boards, and some crude 3D-printed cases. The initial configuration didn’t work at first, so they switched things around and did some more testing. (These are the prototypes you shouldn’t be afraid to break.) The next prototype was a huge leap forward in terms of understanding what the real product would need to do. This first-round prototype was instrumental in increasing the team’s confidence that the idea was sound, and it laid a foundation for writing an initial specification document to guide the continued design and engineering of the product. The prototyping process is a physical manifestation of the growth mindset that informs design thinking. This kind of first-cut prototype is now easier to make than ever before and its importance should not be underestimated. Early prototypes should be tested, documented, and iterated upon. Small loops should expand to include higher-level fidelity prototypes with more features. Often in product development there comes a point where there are multiple potential directions and not enough information to definitively choose one over another. At points like these, it can help to develop a prototype for each leading option. These prototypes can be compared to determine which is the better product or which is more cost-effective, sustainable, or realistic – depending on an entrepreneur’s priorities and constraints. 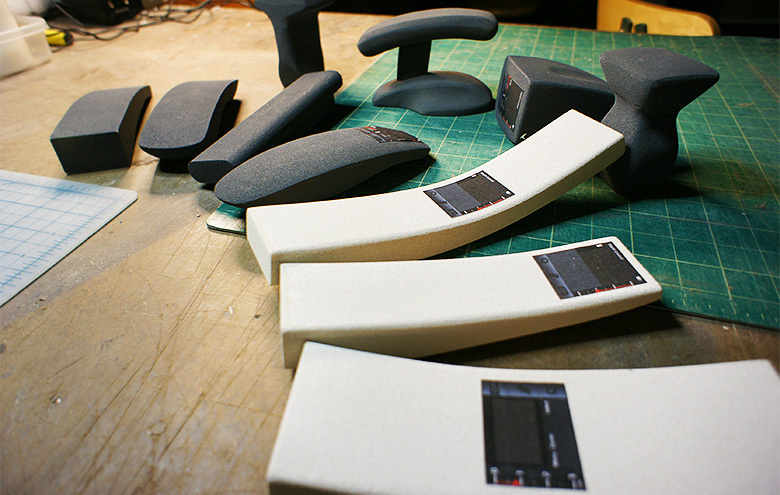 User testing with these prototypes – foam mockups – for a handheld medical device helped determine the final product’s form. Sometimes the variable is the type of technology. For instance, a medical device startup was developing a product and knew that there were two competing pumping technologies that would work. One was aimed at the higher end of the market and the other at the lower end, so that startup created two prototypes to learn about the different solutions and to gain a better understanding of what would be required to produce one over the other. These prototypes were not fully designed products, but they were learning vehicles for performance and testing that allowed the startup to choose one technology over the other. It’s important to build prototypes, figure out what their limits are, and then push those limits. Entrepreneurs should not to be afraid to break their prototypes. 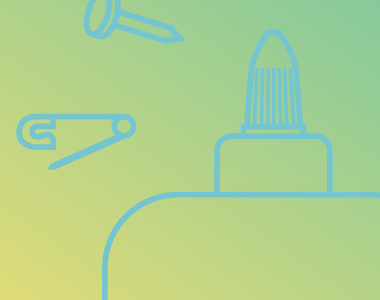 There’s a time to develop a polished, presentable prototype to show investors or share at a trade show, but it’s just as important to learn from rapid prototype iterations leading up to design lock. As the design process advances, each version of the prototype will be more refined and expensive, and changes will become subtler. This is the point at which most startups take their prototypes on the road to share them with investors. Passion is a positive, but investors are more swayed by preparedness. Part of being prepared is having the wherewithal and foresight to have developed compelling prototypes! Successful entrepreneurs know the power of sending prototypes on tour to get investors engaged in the product concept. If you don’t have a prototype, make sure you have a good story, good team, and a proof of concept model to show. While having the best possible prototype available during a pitch session is critical, not every startup will be able to create a top-of-the-line sample. Though refinement is expected, a less refined prototype will work towards helping investors understand where you are in the process. 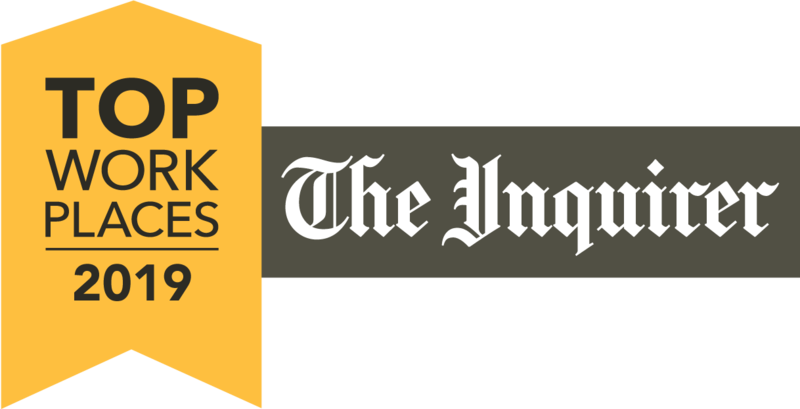 E Ink’s proof of principle prototype paired with a compelling story won funding for the startup. For example, when E Ink – the company that makes the electronic paper displays for Kindles and Nooks – launched, the “ink” barely worked. 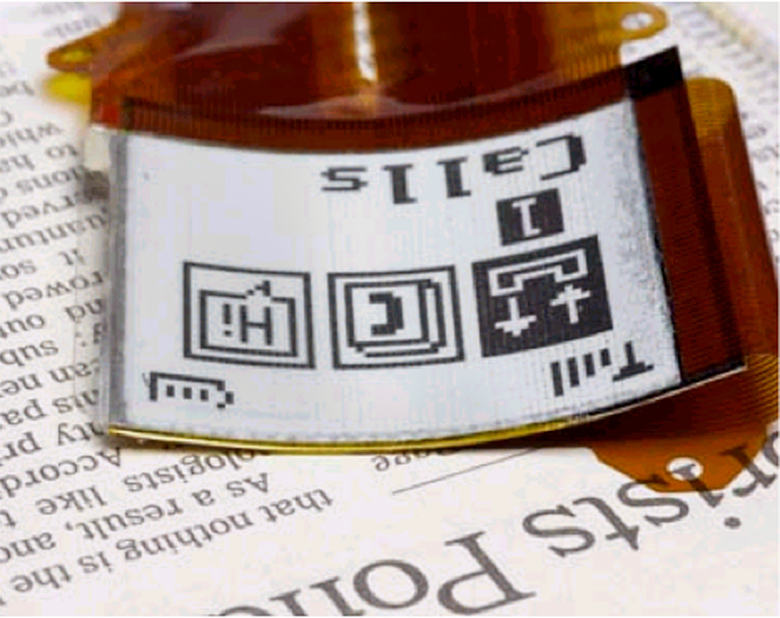 At that time E Ink couldn’t make anything like the display in the current Kindle, and it took years for the technology to reach that point. But E Ink had a compelling story about a world full of people reading electronic books and newspapers instead of pulp and paper publications. This coupled with a proof of principle prototype was enough for investors to connect the dots and see what was possible. When quality prototypes are an option, they allow for feedback. Entrepreneurs often cycle through the product-development process at the same time they’re raising money. Typically they’ll pause at different phases of the project to complete fundraising rounds or to use the prototype to get customers and companies interested in a more refined version. 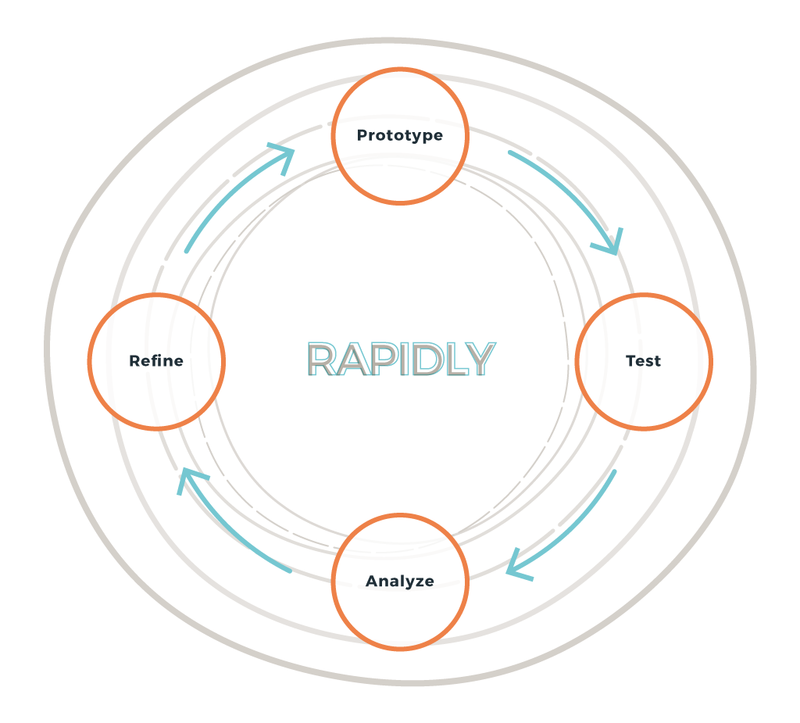 A boilerplate process for rapid prototyping for user research. This can lead to essential feedback that informs the next phase of design. With a physical prototype, it is much easier to respond and provide input. Handling a product raises questions about usability, materials, form, and interactivity that would never come to someone’s mind from looking at a rendering, no matter how well it’s done. Either through user feedback or through testing, prototypes often expose weak points. From a design standpoint this helps you perfect your product, and from a funding standpoint, revealing weaknesses can help investors understand what further resources are needed. Entrepreneurs need a solid understanding of what they’re trying to do before they go to file a patent. Going through the process of building and understanding a prototype can help them write stronger patents because they’ll be able to state exactly how and why their product works. The product specification and definition phases set the stage for formal patent applications. Prototype development can also define new opportunities to broaden the patent suite. With prototypes, entrepreneurs may be able to envision future changes or additions and get claims on those as well. Quality prototypes help pave the way for a smooth manufacturing process. Ultimately, how good a prototype is and how deeply it has been debugged will determine the end result. When a startup moves into the manufacturing phase, it’s critical to be able to show a manufacturer what qualifies as an acceptable finished product. This is especially true when startups work with overseas contract manufacturers. No matter where the product is made, eventually it is important for the prototype be as close to the final product as possible. Most prototypes are made with a different method from the one used to manufacture the final product. What works well in testing with sample materials may not work well with the real materials. Taking the time to go back and redo testing with a finished product made with the actual parts and materials is a critical part of assuring there won’t be issues after it ships. For more about design thinking for early-stage ventures, read JD’s complete chapter in Design Thinking.